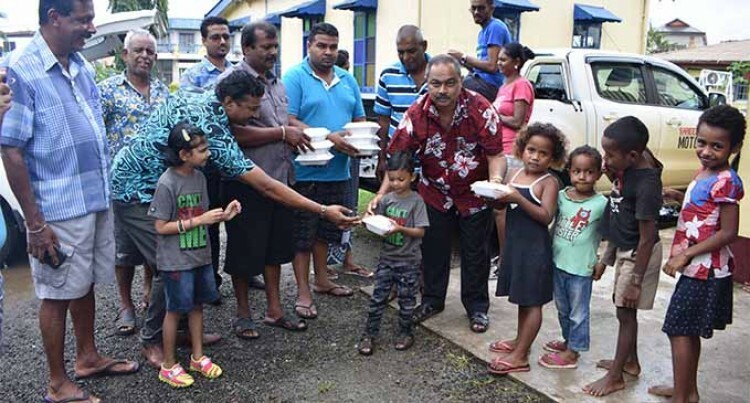 A group of five working men, of the Hindu Milan Mandir Labasa, distributed vegetable palau and tomato chutney to evacuees at Shiri Guru Nanak Khalsa College in Labasa yesterday. Group president Suresh Sharma, an employee of the Bank of Baroda, said they were the first group to reach out to more than 50 evacuees at the school. “After distributing here we will go to the evacuation centres at Vunivau, Batinikama and Nacula,” Mr Sharma said. “We got together at 6am to cook the food, arranged packing and transported it by ourselves. The five members of the group are Bobby Lal, Kritesh Prasad, Atinesh Deo, Surendra Lal and Mr Sharma. The group was formed five years ago to serve the community, develop Sanatan values and do social service. Meanwhile, Commissioner Northern Jovesa Vocea said individuals, businesses, Non-Government Organisations and other agencies were most welcome to assist the evacuees with food and other items. “We advise them to contact our emergency operation centre based at Macuata House on 8280350 or 9990987 and they will coordinate with them as to how to get it done so that no one is left behind,” Mr Vocea said.